A few weeks ago, I was sitting at work thinking about food, as I do, and couldn’t help but salivate at the thought of the thai calamari at Busaba. In its original state it can only be described as amazing heaven in a bite and I must say, –I’m not the only one with that opinion. For those who haven’t tried it, why not?? It’s quite difficult to describe…but i’ll try anyway! There’s a crispy coating, but not deep friend, it’s also got a layer of thai sauce and topped off with green peppercorns. On the whole, the thai calamari is the one dish I constantly crave and if Busaba were to publish a recipe book, it would be the one recipe they would leave out because it draws people to them. Anyway, now that I’m done salivating…here starts the rant! 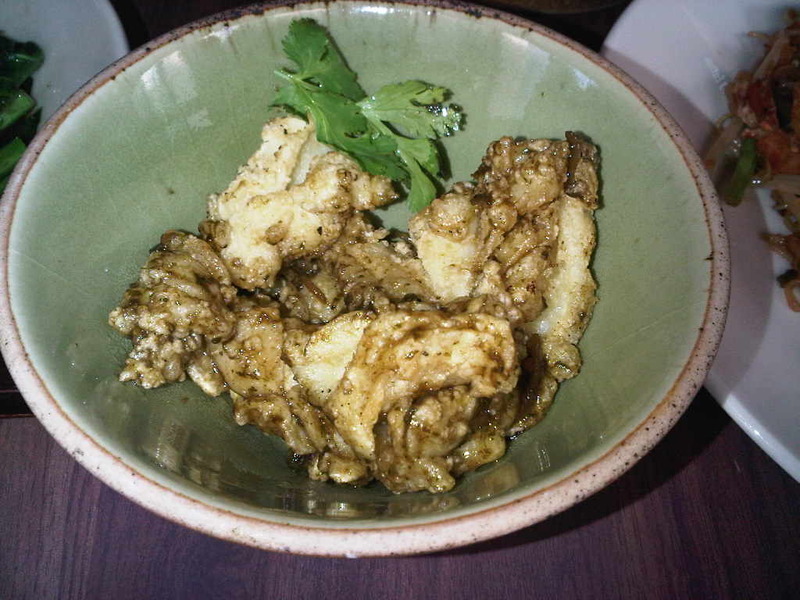 So given that I’ve already made you aware that I constantly crave the stuff, can you imagine my horror when I went into the Busaba at Westfield, ordered the yummyness that is thai calamari and was served a soggy, chewy version, lacking sauce and NO green peppercorns!! Given my disappointment, I was quick to call the waitress over. With the look of ‘I’ve found a fly in my food’ on my face, I pointed out that the thai calamari was all wrong!!! The nice waiter said he would take it into the kitchen and see if there was anything he could do about it. ‘Hah..I was right’ was what I was thinking…and continued to day dream about the taste…until I was bought back to reality by the same waiter telling me that the recipe had in fact BEEN CHANGED!! Apparently people had complained that the dish didn’t taste like calamari and therefore the change had been made. He did tell me that it had only just been changed, the Westfield branch was trialling the dish and that quite a few people had passed a similar comment to me (Whyyyy???). I have since been back to other Busaba’s and have found that my delicious thai calamari has not been replaced with the new recipe. Therefore Thai Calamari…I bid thee fairwell…RIP deal friend..you will be missed!